Concentration is a wonderful thing. Too bad I don’t have enough of it. You’ll understand why in a minute. Recently I had a conversation with another friend who writes and we got onto the subject of influence – the process itself – the analyses, the imitations, the parodies, ultimately ending in absorption. Naturally name-dropping followed – who, when, how, why. My list wasn’t difficult to make: Jane Austen, Edith Wharton, Virginia Woolf, Harper Lee, Billy Wilder, Orson Welles, Howard Hawks, and Woody Allen. That accounted for the who, but the when, how, and why were all much fuzzier in my memory. Ah, I thought, excellent. I’ll do a healthy cycle of introspection and pinpoint what I owe to each. This is where the lack of concentration came in. What happened was, instead of mapping out something insightful about the nature of influence, what I ended up doing was contemplating what it would be like giving the eight of them brunch. Oh sure, it sounds like a real easy job. Set a date and send out the invitations. But there’s so much more to it than that, and I’m not just talking about the menu. The seating plans alone could drive you crazy. Including me, there would be nine of us and nine is an awkward number to seat. 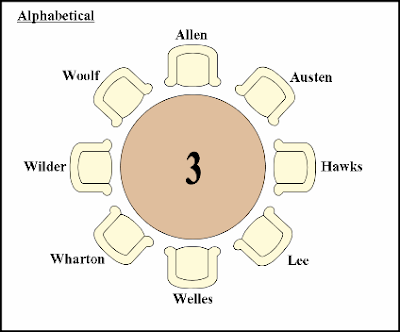 On top of that I decided a round table would work better than a rectangle – no one gets precedence that way, although you still have to figure out where to put everyone. The boy-girl-boy-girl scheme is perfectly respectable. The half-and-half, as in boys on one side, girls on the other, also has its merit. Alphabetical is always an option, but it lacks imagination. It’s like letting the dictionary do the heavy-lifting. To make matters even more interesting, I wondered what it would be like to invite eight fictional characters in place of their creators. To be fair, I invited one female and one male character per actual person, which doubled the number of guests to eighteen and which made it necessary to have two tables. 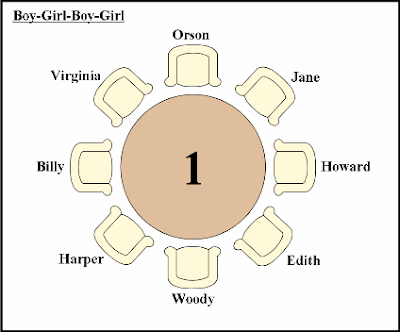 Yes, I know I separated the characters in terms of gender, but I had to narrow down the seating choices at least a little bit. 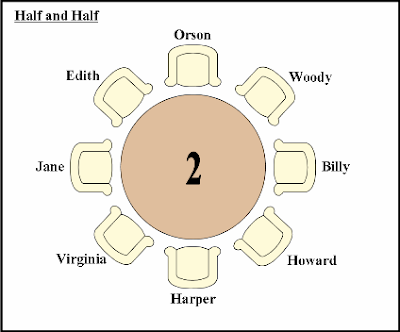 Besides, I would have had to make up more seating charts and you simply have to limit the nonsense somewhere. It seemed like a good idea to keep Charlie Kane away from Newland Archer (they’d only quarrel about society issues) though I wonder whether seating him next to Walter Burns won’t be dangerous. They’re both newspaper men, it’s true, but you can’t trust Walter not to shoot his mouth off. Although come to think of it, putting Alvy Singer on Kane’s other side could be equally explosive. 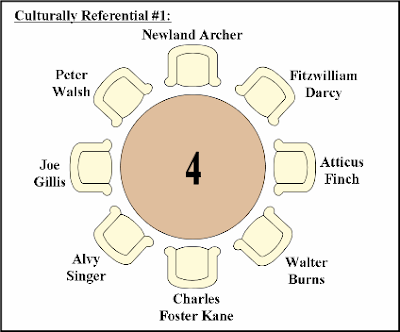 Peter Walsh might feel intimidated sitting so close to gentlemen like Archer and Fitzwilliam Darcy, but he should feel comfortable with Joe Gillis sitting to his right. Atticus Finch will do fine no matter where he’s sitting, god bless him. It was a real dilemma whether to invite Clarissa Dalloway or Mrs. Ramsay, but poor Clarissa is always throwing parties – she’d probably enjoy being a guest for a change, and Mrs. Ramsay probably wouldn’t be able to leave the kids anyway. 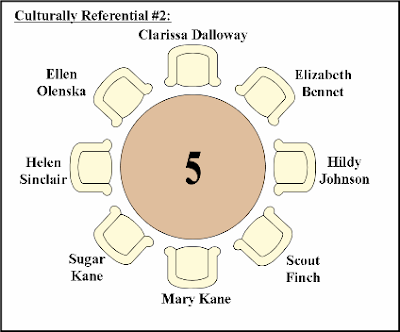 I put Scout between Mary Kane and Hildy Johnson even though I thought she’d like Sugar Kane the best, but I thought it would be interesting to put Sugar next to Helen Sinclair since they’re both in show business. (Since I’m sure you’re wondering – I didn’t invite Annie Hall because I figured she’d be too stoned and you have to remember there’s a minor at the table.) No need to worry about Elizabeth or Ellen Olenska – they both enjoy diversity. You just have to hope that Ellen won’t keep everyone waiting; she likes being the center of attention. I can’t even begin to imagine the conversation at any of these tables. I also couldn’t figure out where the heck to seat myself in all this, but honestly – if such a brunch could actually occur, I’d probably freak out and not show up. Although, theoretically I might attend if either of the culturally referential brunches were a possibility. At any rate, I’d still pay for the meal. I at least owe them that. Thats a heck of list, I would make two addition which would throw out your list. Mary Shelley, would be on my list and Jules Verne... Can you imagin the conversation they would have with Orson Welles.. lol. I'm not very well acquainted with Mr. Verne, but he would make a good addition since science-fiction is rather under-represented... Mary Shelley can come as long as she doesn't bring Percy (or Lord Byron). Few things terrify me more than giving a dinner party. In fact, I do not do it anymore. Here's why: One ended when one (male) guest punched another in the face over a political dispute. The next ended with the woman divorcing her husband and taking their two-year-old daughter two thousand miles away. "How," he kept asking me, "do you justify your existence?" This is a touchy topic with me in any case. Every day I worry, "how can I possibly justify my existence?" Big sums might make it easier for people like my last dinner guest, but strange as this may sound, they would never justify me being myself, breathing, eating, and taking up space on the subway. Stella, don't you have some self-esteem quiz for people who really can not afford to lose their last tiny particle of it? 1. I don't have to justify my existence. 2. I'm making the world a better place. However, these sound as though you're insulted - and you should never sound insulted - so you can just do what I do: smile and say you hadn't thought of that, but you'll try, thanks. Then you try to change the subject and eventually you try to get away from that person. If they start to get more aggressive, just keep smiling. At some point they'll realize they're making an utter fool of him/herself and will hopefully shut-up. I'm sure your self-esteem is fine, Kathleen. It just doesn't help when people are hammering you to defend something you're passionate about. ...So I think you need to be more ruthless Kathleen! Tell folks you're an observational writer and get your material from observing abnormal relationships and disturbed personalities. You'll soon have them quaking in their boots and catering to your every whim! Strangely, only recently when people ask me what I do have I said I'm a writer. They usually look at me in complete awe; I'm not sure if it's because I have cabbage stuck between my two front teeth or that they can believe that short fat women can write. Hmm... Maybe I should tell them I'm a celebrity chef. I'll seat you next to Clarissa Dalloway - that'll make an interesting situation.